Blunt ends and large waves encourage volume and body in this lovely shoulder-length bob that is ideal for medium to thick hair. This classic 'do is perfect to compliment an oval or oblong face and needs product throughout -especially at the sides- to create this voluminous look and feel. Our model is sporting a bob with a twist here that has a fabulous finish to it. This hairstyle looks great on her oblong face shape and is ideal for her low, straight hairline. This â€˜do gives our model oodles of volume at the sides and has tons of bounce throughout to balance out her predominantly vertical face shape. Ladies with a thick hair texture like hers will benefit from this hairstyle that makes the hair less bulky thanks to the layers throughout and encourages movement. She has gone with a side part here that works well with her low forehead, and allows her grown out bangs to cascade nicely around her cheekbones. The outward-facing curls add width to her face shape thus balancing her oblong shape and making it appear more oval. Our modelâ€™s color is another stand out feature of this â€˜do. Her rich copper base color has been highlighted through the lengths and ends with bold blonde tone creating a subtle ombre effect. Overall this maintains her natural hair color but with added warmth and dimension to it. This dynamic hair hue looks lovely with her fair, cool complexion and blue-grey eyes. This is an excellent color technique for ladies with thick hair who want to add a cool color affect that leaves the hair looking healthy and shiny. 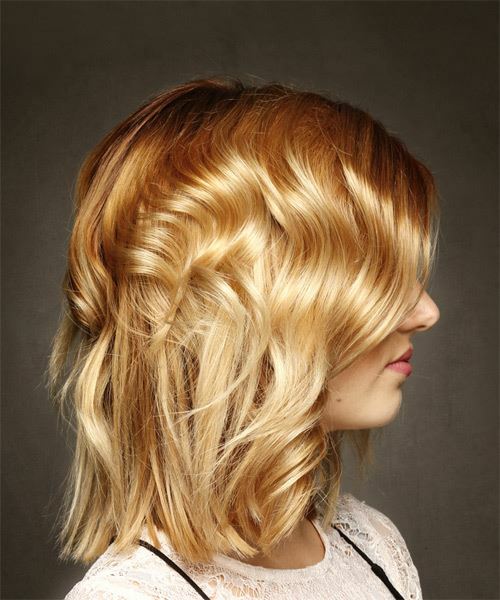 Use large hot rollers twisted away from the face to create these curls. Use your hand to scrunch the hair as you blow-dry. Remember to keep the blow-dryer on a low speed and heat setting and to leave some moisture in your hair. A large hot roller is used to give your hair a larger curl and to add lots of body. Take a section of hair no wider than the diameter of the hot roller and comb it through to ensure there are no knots. Place the roller at the ends of the section of hair, being sure to smooth the ends under, and then twist the roller vertically, making sure to roll it backwards, along the hair shaft to the roots and secure it with a pin or clip. Keep the rollers in your hair until they cool. Take a section of hair from the nape no wider than the diameter of the hot roller and comb it through to ensure there are no knots. Place the roller at the ends of the section of hair, being sure to smooth the ends under, and then twist the roller vertically down the hair shaft to the roots and secure it with a pin or clip. Continue this step until the entire back section of your hair is completed. Keep the rollers in your hair until they cool. Apply your moulding cream to the ends of your hair and then lightly pinch and scrunch the hair before allowing your moulding cream to set. Comb your hair into the desired direction that you require for styling.